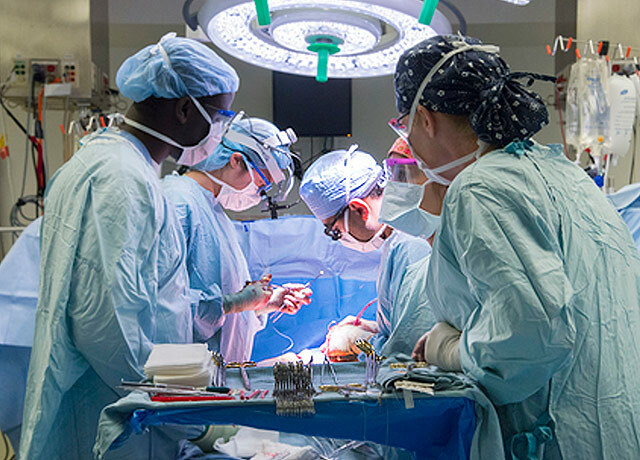 From 2013 to 2017, UW Medicine cardiac surgeons transplanted an average of 48 patients a year. UW Medicine’s heart-transplant team this month began giving all of its patients access to suitable donor hearts from decedents who tested positive for the hepatitis C virus (HCV). Previously, these organs were available only to patients who already had the virus. “The risk of death on the wait list is real, so we think patients will appreciate the option to access HCV-positive hearts,” said cardiothoracic surgeon Jason Smith. “Based on direct-acting antivirals that appear to eliminate HCV from patients’ systems, and on favorable results from other centers, we’re confident that we can safely transplant these patients and then clear them of any transmitted virus before it creates health problems,” said Dr. Jason Smith, the cardiothoracic surgeon at UW Medical Center who is directing the protocol. As of June 4, 4,017 U.S. patients awaited heart transplants, including 101 in Washington, Alaska, Idaho, Oregon, Montana and Hawaii, according to the United Network for Organ Sharing. “The risk of death on the wait list is real, so we think patients will appreciate the option to access HCV-positive hearts to improve their chances of being transplanted,” Smith said. If transplant centers nationally were to adopt this openness to HCV-positive organs as standard care, donor organ availability and usability would improve. According to the Centers for Disease Control and Prevention (CDC), an estimated 3.5 million Americans have chronic hepatitis C, which is spread via contaminated blood. In about 15 percent of cases, people’s immune systems can defeat a newly transmitted virus, but most cases become chronic. In the past, when treatments were less effective and poorly tolerated, HCV could damage the liver to the point that cirrhosis or cancer developed. In the past decade, the U.S. incidence of new HCV infections has risen, particularly among people under age 39. The CDC attributes this largely to the opioid epidemic, in which drug users share needles and injection equipment. This development and the aging of the baby boomer population, who represent most U.S. cases of HCV, have contributed to a recent increase in deaths among people with the disease. Historically, organs from HCV-infected donors have not been considered for transplant. Infrequently, cardiac surgeons have transplanted infected-donor hearts into patients who either had HCV already or were virus free but gravely ill. These patients typically ran into long-term complications stemming from the virus. In 2014, drugs became available that eradicate the virus in more than 95 percent of HCV-viremic patients. This development has led a small group of U.S. hospitals, so far, to develop protocols to accept organs from HCV-positive donors and offer them to HCV-negative recipients. In April, doctors at Vanderbilt University Medical Center in Tennessee published results of their initial efforts with a protocol: Between September 2016 and March 2017, they transplanted 12 unexposed patients and one previously treated for HCV with hearts from donors who had tested positive for HCV. All eight patients who developed HCV infection and who completed a 12-week course of direct-action antivirals experienced a “sustained virologic response” – that is, a cure. UW Medicine joins a small group of U.S. hospitals that accept hearts from HCV-positive donors and offer them to HCV-negative recipients. UW Medicine performs the most heart transplants of any center in the Pacific Northwest, averaging 48 per year from 2013 to 2017. Prospective candidates for HCV-infected donor hearts must sign two consent forms (links 1, 2) indicating they have been apprised and understand the risk of disease transmission. If they go on to receive such an at-risk heart, they must take daily oral medication for eight to12 weeks after hospital discharge and then undergo blood draws to confirm their viral response. UW Medicine is in the process of adapting this HCV protocol with liver transplants, said Dr. Renuka Bhattacharya, medical director of that program, and may consider it for kidney and lung patients at a future time. Initial results from early-adopter centers indicate that the medical therapy poses no risk to patients’ immune systems, which are weaker because patients also must take medications to limit their bodies’ innate response to reject donor organs. However, because these cases are still low in number, there is insufficient evidence to say with certainty that no such risk exists. One potential barrier to these protocols is the cost of direct-action antivirals that are so highly effective against hepatitis C. Pharmaceutical companies have reduced costs significantly in the past year, but the regimens still can run into the tens of thousands of dollars, and may lead an insurer to deny coverage.